The term, "coat of arms" is loosely applied to mean the complete armorial "achievement". Depending on the armiger’s status this may include many parts - shield, helmet, mantling, torse, crest, motto, supporters, compartment, cri-de-guerre, or chief’s motto, badge and others. The armorial bearings of the Lords of ancient Galloway were blazoned Azure a lion rampant Argent crowned Or. That is to say, their shield was blue, bearing as its sole charge a rampant lion in silver, with a gold crown on its head. These are still the armorial bearings of Fergus Macdowall of Garthland, whereas other armigerous MacDowalls have slight variations by which to distinguish their respective branches of the family. 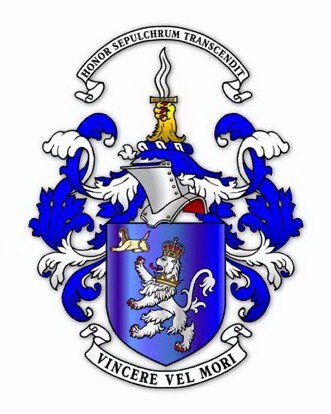 The armorial bearings of armigerous families surnamed Galloway have always been of reversed tincture. That is to say, their shield was silver, bearing a blue lion - and without the crown. The various armigerous families of Galloway have, of course, displayed Arms differing one from the other by means of additional heraldic charges. "In the glowing pageantry of emblazoned Armory, the annals of Scotland, of its clans, its houses, its surnames, are written in characters which inspire the mind and thrill the eye, but which above all proclaim our native pride and the kindly ties of Scottish clanship and kinship." The derivation of the white lion on a blue field is conjectural. However, one can perceive that from Fergus (d. 501 A.D.) the first King of Scots in Dal Riada and the son of King Erc, the white lion on blue was the symbol of the Seaborne Cowall-Antrim-the Isles-Argyll-Galloway line of Dal Riada. This contrasts with the red lion on gold of Dal Riada, which was carried to the present royal family through the interior Gabran-Kenneth mac Alpin-Malcolm III ("Ceann-mor") line. The white lion was carried per pale (on blue) with the lymphad (galley) by Somerled, King of Argyll (killed 1164) and these charges were quartered by his heirs the MacDougalls down to the present house of Dunollie. The Lamonts also bear a white lion on blue, and descend through Ladman (c.1238) from the Irish prince Anrothan, who married an heiress of Cowall (Scottish Dal Riada) c.1050. By the same origins the MacNeill of Colonsay et al, quarter these Arms. Most anciently on record, which might be considered the historical origin, Prince Fergus de Galloway (1096-1161) carried the white lion rampant on a blue shield. The heraldic blazon of his Arms was, Azure a lion rampant Argent. (The historian) Nisbet refers (loc. cit.) to the lion of the ancient Lords of Galloway as being collared with an antique crown. He further cites (the historian) Camden as telling that Henry I of England granted to (Prince) Fergus (his son-in- law) the lion crowned. This crowned lion rampant can be found in the Arms of Fergus’ successive heirs, including Roland’s on the ceiling in the Chapter House at Glenluce Abbey, Alan’s on his seal as one of the King’s Securities to the Magna Carta, and on the seal of Alan’s heiress, Devorguilla, Lady of Galloway, at Balliol College, Oxford, which she and her husband (John Balliol) endowed. The tinctures of these Arms were apparently reversed for the descendants of Alan’s brother, Thomas, Earl of Atholl, and for Edward Bruce to whom the Lordship of Galloway went after the defeat of King John I (Balliol) and his ally Dougal MacDo(u)(g)(w )all. The original Arms were restored in favor of Sir Archibald the Grim, 3rd Earl of Douglas (1325-1400) and the Douglasses continued to quarter them with their own in their several houses who were Earls of Wigtown and of Angus, Lords of Nithsdale, Marquesses of Douglas, Dukes of Touraine (in France) and others, down to any surviving branches well after their forfeiture of the Galloway lordship in 1455. These include the Earls of Home, as Barons Douglas of Douglas. The M(a)cD(d)ou(g)(w)a(e)lls have continued use of the plain Arms of ancient Galloway as next heirs male. Those recorded for Macdowall of Garthland have taken several forms. In 1604 the blazon was: Azure, a Lion rampant Argent gorged with an open Crown standing on a rock proper in Water or Sea in Base. In 1630, the blazon was simply: Azure a Lion rampant Argent. In 1661 they were shown as: Azure a Lion rampant crowned Or. These latter Arms are quartered by Napier of Merchistoun. Other cadets of Garthland in the 17th Century were the MacDowalls of Machrimore, Knockglass, Dalreagle, Lefnall, Corochtrie and Crookuncrush. Some of these and the MacDowalls of Myroch and Mindork were on record two centuries earlier. The estate of Elrig changed often between stirps of Garthland and Logan, whose other cadets included McDoualls of Crichton, Ardwell and Culgroat; whereas cadets of Freugh included McDoualls of Hackburn, Stratford Hall and others. When Sir James Galloway (later the first Lord Dunkeld) petitioned the Court of the Lord Lyon in 1631 to "assign unto his ancient coat-armour a crest", the ancient coat-armour which he possessed was a white shield bearing a blue rampant lion, with a red tongue and claws, described in heraldic language as, Argent a Lion rampant Azure armed and langued Gules. Lyon King of Arms ratified these bearings; that is he recognized their legality, thus indicating that Sir James Galloway’s claim to this version of the Galloway Arms must have been rooted in antiquity. This gives additional reason to believe the tradition that this family descended from the illegitimate off-spring of Thomas de Galloway, Earl of Atholl. In the 13th Century there were incidents where illegitimate progeny of armigerous paternity reversed the tinctures of the parental Arms thus indicating their "left-handed" descent, but still showing their blood line. The fact that Sir James’ Arms did not include a crest is another indication of their antiquity, for it was not until fairly late in the Middle Ages that crests began to appear in armory. At first it was only the great nobles, that is, those of tournament rank, who were allowed the added dignity of a crest. Eventually crests were granted along with new grants of Arms as a routine, but possession of Arms without a crest was considered evidence of considerable antiquity of possession. At least seven versions of the Galloway Arms with the blue lion as the main charge are on record. These are Galloway of Blervie, Galloway of Sandyhills, Galloway of Auchendrane, Galloway of Homstead Manor, George Washington Galloway (1810-1890) a citizen of Edinburgh, Galloway in Ottawa Canada, and a coat listed in Papworth’s Ordinary of Arms under the name of Gallaway (sic), but with no territorial seat or place of residence given, other than Scotland. Supporters or bearers are a heraldic honor granted in Scotland to peers, certain knights, chiefs, pre-1592 Parliamentary lairds and others within the prerogative of the Lord Lyon. Minor barons ante 1633 and those able to prove use of supporters before 1672 also may have eligibility. When granted, supporters are usually placed on both sides of an armorial shield as though holding it in position. The supporters may take a variety of forms: lions, unicorns, horses, men, or other objects. Grants of supporters were made to Patrick McDouall of Logan in 1676 and to his son Robert McDouall of Logan, who matriculated arms in 1719. These supporters were two rampant lions argent (silver), crowned with antique crowns or (gold), armed (claws) and langued (tongue) gules (red). In the case of Patrick they support arms charged with a lion rampant but gorged (around the neck) as in the past but with an antique crown. As Andrew McDouall of Logan showed in his article published in Burke’s Landed Gentry. Robert’s charge was crowned with an antique crown. This is curious, since Robert had argued strongly against the crowning of the lion in his article published by (the historian) Nisbet. It was, however, a progression, with differences, in Logan’s claims which followed after the grant of arms to Garthland in 1672 consisting of the lion of the ancient Lords of Galloway (crowned with a "ducal coronet"). The Chiefship of the Name and Arms of MacDowall was not clearly resolved, but with respect to the honor of supporters several points are worth noting. The supporters of Logan were awarded on the basis of their pre-1592 de jure Baronage. This evidence survived in their charter of 1454 under the Great Seal, which refers to Dominio de Logan, and in their charter of Nova Damus for the Barony of Logan in 1503 under the Great Seal. The latter replaced older charters of Logan, blanch, of the Crown, lost in a fire. Nisbet published the achievement of Patrick McDouall of Logan. It is to be regretted that this noble household ended with Andrew McDouall of Logan in this century (20th). Nisbet also published the entire armorial devices sent to him by Alexander MacDowall of Garthland and Patrick McDouall of Freugh. He referred to Garthland’s previously published and matriculated arms with the proviso, "but there is no mention of supporters; yet I am informed the family has been in use to carry supporters." These are shown on Alexander MacDowall’s (d. 1733) seal of arms, still with Garthland, as two lions, each gorged with a coronet and holding daggers in their raised rear forepaws. Strangely, Nisbet also showed the lion on the shield as crowned with an antique crown, which is not clear on the seal and was not matriculated in 1672 by Alexander’s father William, whose lion was crowned with a coronet. In 1749 William MacDowall 2nd of Castlesemple, a cadet of Garthland who later came into Garthland, matriculated arms with a crescent for difference and a lion crowned with an antique crown. This was partly indicative of William being heir-presumptive to his cousin Garthland. Garthland is now permitted, as Chiefly bearers, lions rampant gorged with antique crowns to represent the family as a whole and the legendary usage. 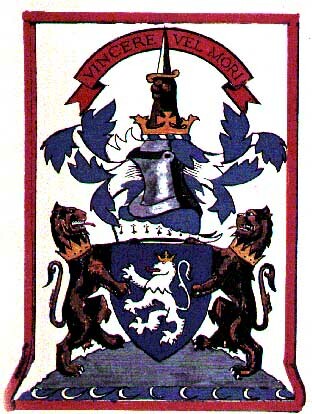 McDouall of Freugh claimed to have borne at home c.1474 and 1543 armorial devices which included as supporters two wild men wreathed about the head and middle with laurel, holding upwards flaming-daggers in their outside hands. The arms they support have the lion rampant crowned with an imperial crown and gorged with an antique crown. Freugh, however, had no surviving public authority for arms which even if registered as required by the Statute of 1672, were lost by attainder in 1680 because of calamitous events at Freugh in opposition to the "Killing Time". This lack of matriculation may account in part for the absence of representation of Freugh in the arms of their successors and collaterals, the Stuarts of Bute. As peers of the realm, the Galloways Lords Dunkeld were entitled to supporters to their arms. Unfortunately, no pictorial representation of these supporters has been obtainable. However, in The Peerage of Scotland the Dunkeld supporters are described as: Two Eagles Sable, whereas in a later work, The Scots Peerage, they are described as: Two Eagles volant proper. "Sable", is the heraldic term for black, whereas "proper" is that for the natural color of the bird, animal, or plant depicted. The term "volant" means flying. It can be seen that these two textual versions leave room for the heraldic artist’s imagination! It might be well at this point to mention that Sir James Galloway (later 1st Lord Dunkeld) petitioned in 1631 for a crest, scroll and motto to be assigned "unto his ancient coat-armour", suggesting that he was of armigerous descent. The supporters would be granted on his elevation to the peerage, May 15, 1645.